Whispering Colour asks us to examine our learned and automatic responses to an inferred value system of colour and the essence of natural materials. Unified in their poetic commentary, and considered in their quest for harmony, these six artists make work that is lyrical and evocative in its aesthetic. An engagement with natural materials is found in the works of Susan Gunn, Philippa Lawrence and Sue Arrowsmith is contrasted with the synthetic structures of Rosalind Davis, Michelle Benoit’s colour-coded histories in resin and artificial aquarium gravel used by Dolly Kershaw. This dichotomy between holding or relinquishing control is further explored in the processes and materiality of the works. While some artists induce nature’s course, others trace it with a perseverance that alludes to the limitations of traditional tool or medium. 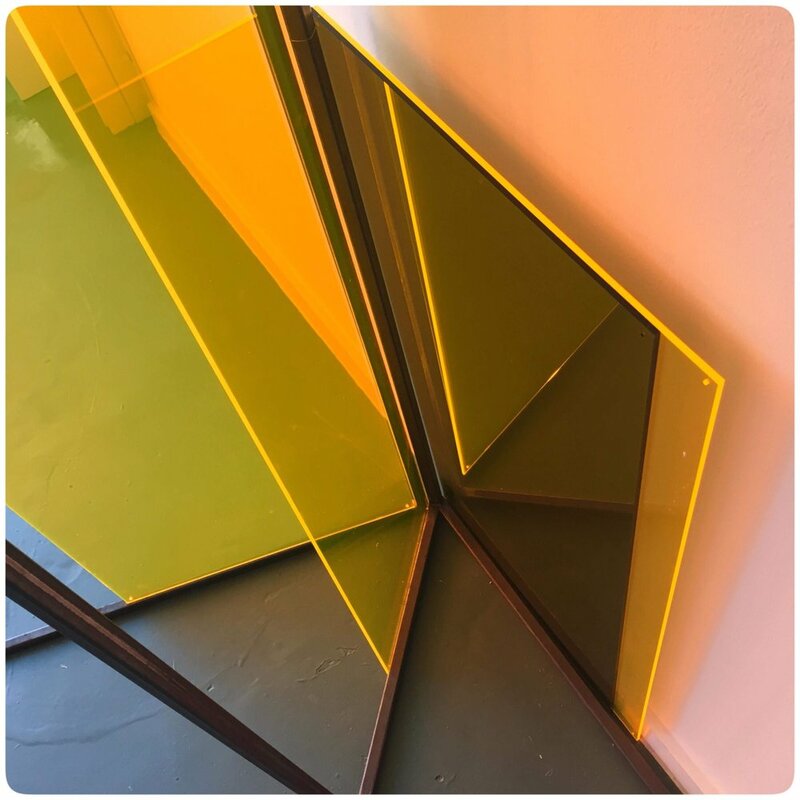 …………………………………………………………………………Sue Arrowsmith's work is rooted in the formal qualities of abstraction and temporality, refracted through the natural world. Her paintings are like haikus to the world she observes on regular walks both in London and further afield. Highly detailed and meticulous, Arrowsmith’s work combines the human touch and the natural flow of her medium. She prepares this herself creating small pools of liquid gold and bronze by diligently grinding sticks of Japanese sumi ink. Arrowsmith has exhibited widely in the UK and Europe since graduating from Goldsmiths College, London in 1990 with a BA Hons Textiles degree. She was a prize-winner in both the John Moores Liverpool Exhibition 20 in 1997 and the Natwest Art Prize, London in 1998, and in 2010 was Artist in Residence at the Josef and Anni Albers Foundation, Connecticut, USA. She lives and works in London. Michelle Benoit’s works are colour-coded symbols of and for past events, memory and place. These seemingly illuminated objects are created in an additive way, where Benoit begins with a flat surface of wood and layers transparencies atop it to create depth. She describes each result as ‘a contemporary geologic core sample, a very personal, yet collective landscape’. Benoit is based in Rhode Island, USA, and is a graduate of Swain School of Design, Rhode Island College, and The University of Iowa. She has exhibited extensively in the USA and works are held in public collections including The University of Iowa museum and in numerous private collections. Rosalind Davis’ central concern is the transformation and reconfiguration of space through multiple disciplines. Constructed from modular elements, her site-specific installations are re-assembled afresh for each exhibition and respond according to the particular architectural conditions of the site, such as scale and light. The resulting environments probe the relationships between both the physical and psychological aspects of space. Davis is an artist-curator and a graduate of The Royal College of Art and Chelsea College of Art. She has exhibited nationally and internationally, at galleries including the Courtauld Institute, Griffin Gallery, Arthouse1, Standpoint Gallery, Transition Gallery; The Roundhouse; Phoenix Brighton; APT Gallery; the Lion and Lamb Gallery; The ING Discerning Eye; the Lynn Painters Stainers Prize. Her work is held in a number of private and public collections including Soho House. She is also a member of the Undead Painters. Susan Gunn’s ground paintings reveal a sculptural physicality that embody a tacit strength and fragility. She explores an original and repetitive technique of building layers of gesso, incorporating natural earth and mineral pigments and base substances such as chalk, coal and marble dust. Cracks and fissures, typically a defect in the gesso surface, are induced in the work that are beyond the artist’s control. Gunn studied at Bolton School of Art in the mid 1980s and her BA in Fine Art Painting at Norwich University of the Arts. She recently exhibited in the Manchester Contemporary 2017 and in Contemporary Masters From Britain at the Jiangsu Art Museum, Nanjing, China. Her work is in collections such as Arts Council England, the Madison Museum of Fine Art, Atlanta. Philippa Lawrence's diverse practice embraces land and environmental art, the use of textiles in a fine art context, and the relationship between art, craft and design. Her work pivots on material exploration, drawing out a material’s ability to carry metaphor and speak of human experience. Lawrence trained in Fine Art Printmaking at Norwich School of Art and the Royal College of Art. she works on site-specific projects, commissions and exhibitions. She has exhibited widely both in the UK and internationally, including America, Japan, Czech Republic, Canada, Iceland and Australia..